It wasn't intentional, but today's post times perfectly with War Banner announcing their preorders for their new game Mortal Gods. I've been pretty excited about it since it was first announced, which is a bit out of character for me as I've never really been in to ancient Greek history as a period. The first of the three models is the initial limited run Lochagos. What Greek leader would be caught dead with out his wine jug? Now here is where I have failed and go on a tangent. Normally, I paint some models, take some notes, paint more models, take more notes, and repeat until I get around to taking photos and the writing blog posts. 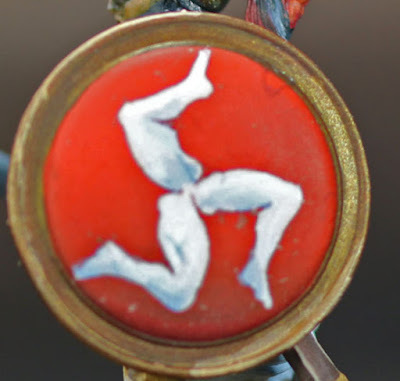 Well, unfortunately, these, as well as my next few posts worth of models, were all painted during the holiday season and I forgot to take notes. Oops! But, I'm pretty sure no one comes here for my painting recopies anyway. The only two parts I remember are the bronze armor was painted using (in order) Scale 75 Decayed Metal, Old Copper, Victorian Brass, Amber Alchemy and Moonstone Alchemy. Additionally, for the flesh, I followed a really excellent guide on CMON for various ethnic skin tones. This guide suggests Mediterranean flesh be painted with Valljeo Chocolate Brown #872, 50/50 US Tan-Earth #874 and Cork Brown #843, Cork Brown #843, Flat Flesh #955, 80% Light Flesh #928/ 20% Beige Red #804. The only problem with that is I don't own all those colors! But the mobile app Paint Rack gives good approximations. So what I used were 50/50 Citadel Skavenblight Dinge and Baneblade Brown, 50/50 Baneblade Brown and Cork Brown, Cork Brown, P3 Midlund Flesh, Scale 75 Pale Skin with a little bit of Foundry Light North African Flesh mixed in. 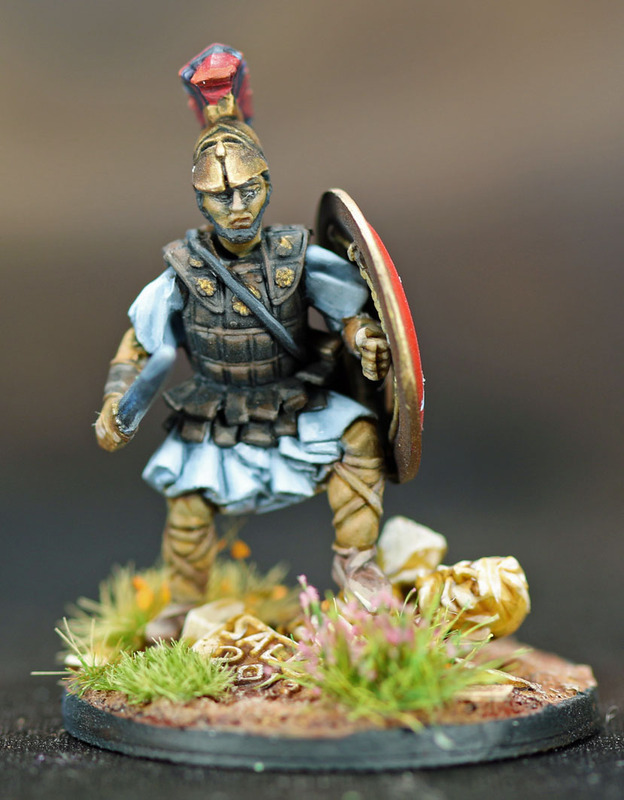 While I was painting the Lochagos, I also worked on the Salute 2013 Jason (of the Argonauts) from Renedera. 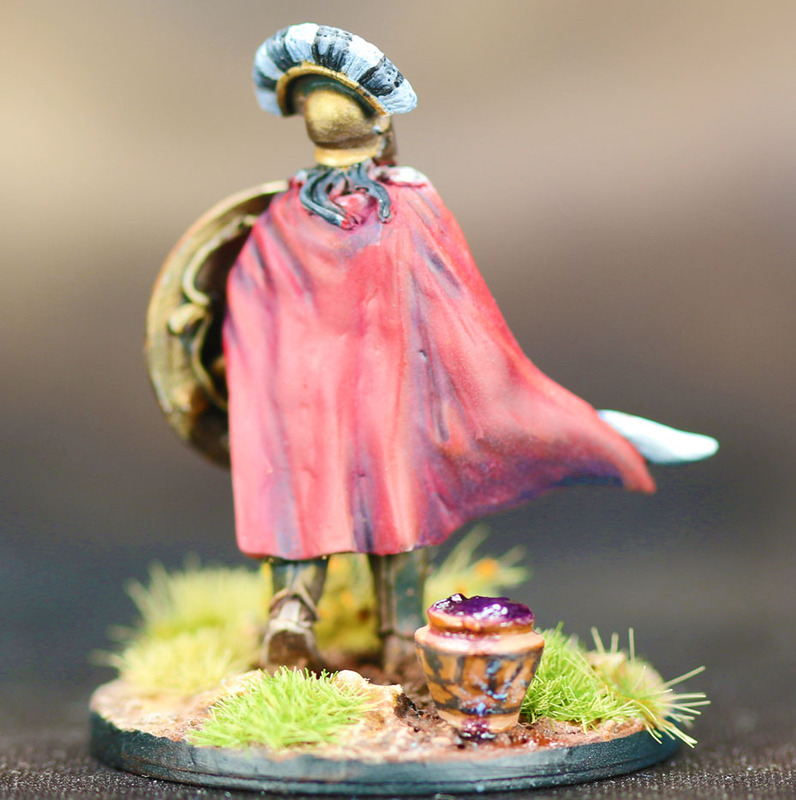 He was gifted to me by a lovely chap who also sent me the transfers for the shields. 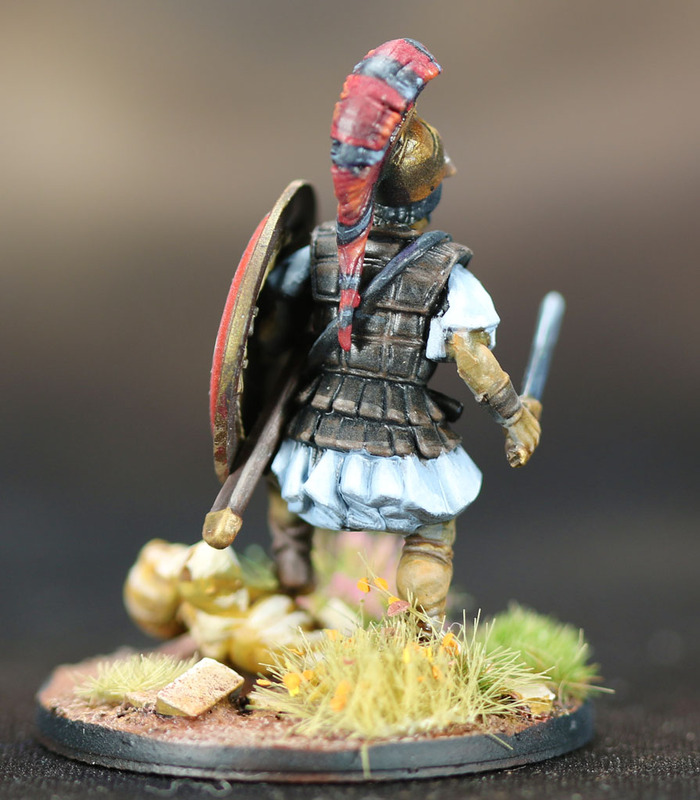 The bases were done with various earthy-reds, since Greece has lots of clay, and the statue he is standing on was based with Citadel Zamesi Desert and white was mixed in for the highlights. Both shields were airbrushed with their respective colors and a few highlights were added before the transfers were applied and, once sealed, painted over. 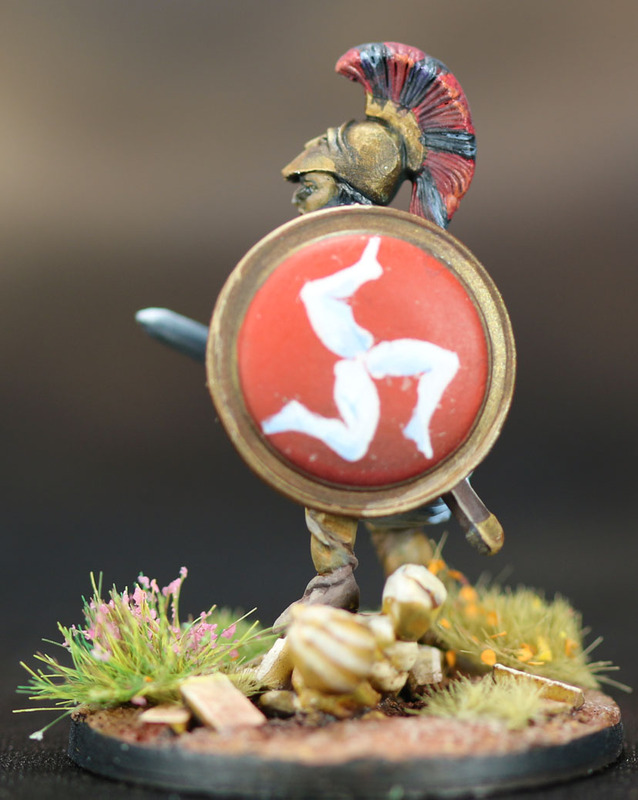 Finally, I applied a bunch of various dusty pigments to the bases and got a little on the shield as well. Warning, the vibrancy was cranked way up so that the shadows of the transfer weren't washed out. One other thing that War Banner has discussed is the possibility of adding some mythological components in the future. So just to be ready, I also painted up this Bear's Head undead Spartan I had lying around. You know, just in case! 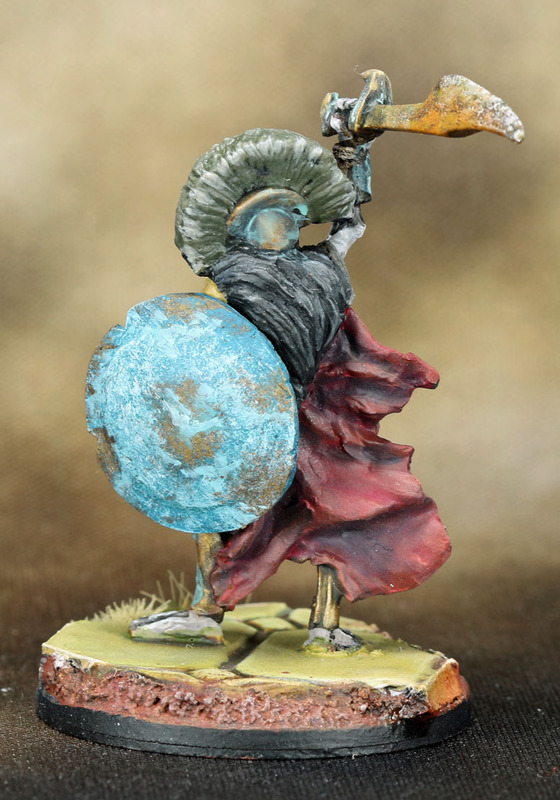 He was painted pretty much the same but with way more weathering! Very nice. 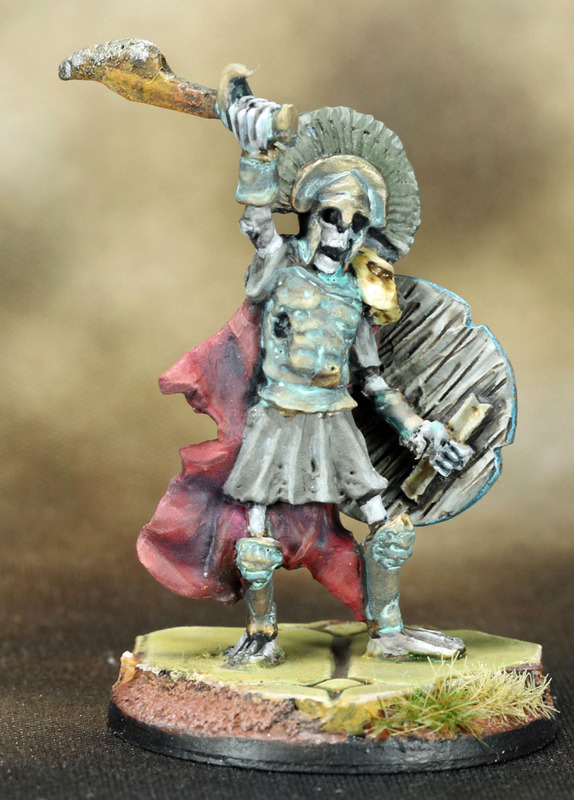 I'm also putting together an undead classical Greek army. I love the theme. Thanks, I'm going to check it out now! Pretty awesome! Wow, I love all of them. I'll check that Mediterranean skin recipe. But oh, the undead was totally unexpected; damn, it's gorgeous! 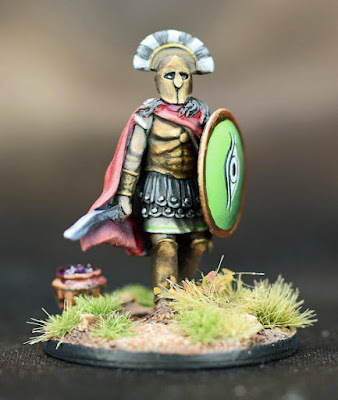 They look fabulous, and a little bit of Greek myth is very welcome :) I couldn’t find the Paint Rack app, how is it listed? Always looking up ‘equivalents’ to certain brands so I wonder if it would be of use to me. Looks like it might be Android only.